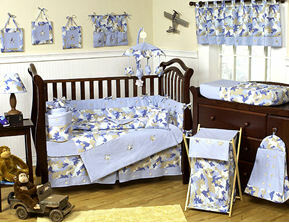 Brown and blue camouflage baby bedding is not as well known as Mossy Oak, Realtree or other camo patterns widely used in hunting and military themed rooms. 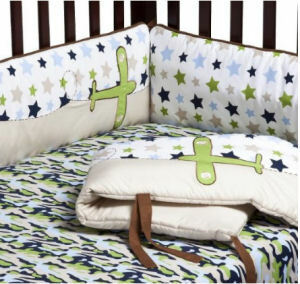 However, moms with baby boys are venturing out and exploring their options with blue camo nursery bedding just because they like the lively print although they would prefer it not to be in drab olive green. And as you will see, blue camo print is super for a baby boy's nursery decor when you just want to decorate using a blue and brown nursery color scheme or you can use it as a background for an outdoorsy theme designed with earthy colors. The irregular pattern makes a nice background for a baby's hunting theme or a fishing theme because the brown and blue camouflage baby bedding has that distinctive print associated with the deep woods. Baby blue and green create a pleasing color combination for an Air Force nursery theme or, for that matter, a nursery with no theme whatsoever! Please make plans to visit us again soon to see our latest ideas for decorating a nursery in the latest themes and colors. My husband and I don't hunt, fish and we aren't in the military; we just think blue camo is cute for a baby boy's room.